There’s no question about how big daily fantasy sports has become. It’s become absolutely huge. The real question on the minds of most daily fantasy sports fans: what’s the best DFS site besides the DFS giants FanDuel and DraftKings? FantasyDraft is one offering that appears to be full of potential. 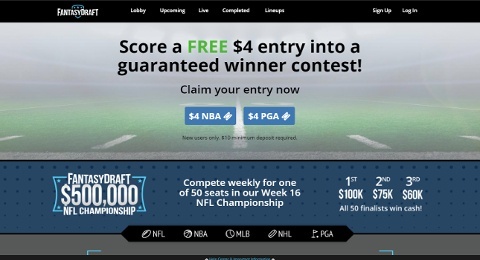 We set out to see what FantasyDraft has to offer everyone who enjoys playing fantasy sports. What we found was a good site for people to draft rosters and possibly win money. Overall the site’s simple, reliable and has attractive features similar to other fantasy sports sites. Like other fantasy sports sites, FantasyDraft lets you draft rosters of players in upcoming games from a particular sport. Rosters are made up of athletes from professional sports leagues like the NBA, NFL, PGA, NHL and the MLB. Build rosters for fun or compete against other fantasy rosters for real money. 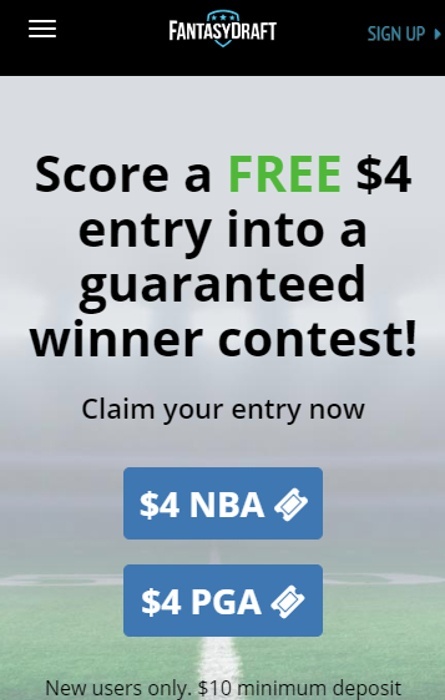 That’s why FantasyDraft offers its new users a free $4 NBA GPP ticket on the first deposit. This site also offers a referral rewards program paying you to refer your friends that’s unmatched in the industry. In this review, we’ll see if FantasyDraft proves a viable competitor to the top DFS sites. The FantasyDraft desktop site has a simple user-friendly interface that easily puts all the contests you can join front and center. You can easily join contests whichever sport you already follow. Search for contests based on sport, type of contest, experience level then match-up against the competition, roster for roster. The site helps you organize all the lineups you’ve created in one place, so you can better plan and strategize for contests you’re participating in. FantasyDraft also organizes all your contests into upcoming, live and completed. This organization gives you easy access to each of your contests past, present and future. The FantasyDraft mobile site works much like the desktop site, properly optimized to work well with smartphones and tablets. One big difference is the contest selection is no longer the first thing you see on the site and has been moved to a separate “View Contests” section. The mobile app offered by FantasyDraft is a markedly smoother system. The intuitive interface better engages customers through their mobile device anytime. The FantasyDraft app is definitely a more attractive version of the same fantasy sports website for either desktop or mobile devices. 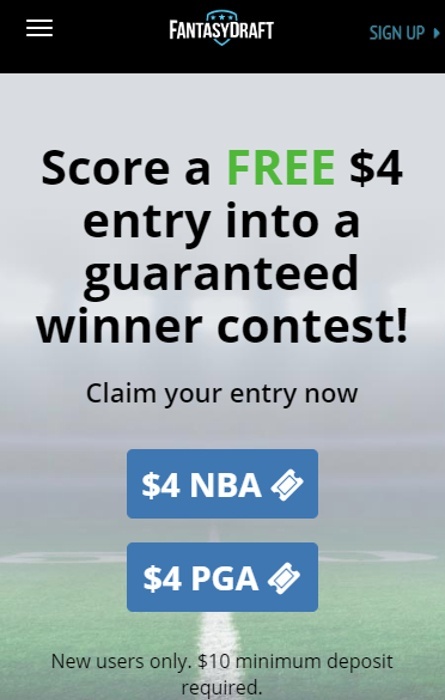 FantasyDraft brings its customers the opportunity to join or create their own daily or weekly fantasy contests. Plus, you can choose to compete in contests that include the upcoming games in the sport of your choice. Just like most fantasy sports sites that are out there, all rosters are put together with a “salary” provided by FantasyDraft. There is also a salary cap that restricts your drafting to only athletes who you can afford with your available salary. 50/50s: In this contest the field of participants is divided in half. One half being the winners, the other being the losers. The goal of the 50/50s is to finish in the top half. Head-to-Heads: This most basic of all fantasy sports contests. Head-to-head contests involve you and one other person competing to see who has the best lineup. Multipliers: Winners of these receive multiple of what their buy-in was. This can be as much as 2x or even 10x the original buy-in depending on the multiplier chosen. Qualifier: There isn’t just a standard buy-in to enter qualifiers like there is for other contests. To get into one, you must win your way into qualifying for one of these contests. There are a lot of customer support options available at this site. If you have any questions about how to play with FantasyDraft, there is a wealth of resources found at the help center to explain just how the site works. Check out how-to videos that give you all the basics of using the site like how to draft a team, how to pick a contest and how to create your own. There is also a FAQ section that provides helpful answers to questions on everything from how to sign up for an account to how critical parts of the FanstasyDraft platform operate. In the event that you experience some type of technical error or issue while using the Fantasy Draft site, you can contact their customer support team by email. From the support section of the site, you can fill out a support ticket with as much detail about your request as possible. Funds can be deposited with no fee and may even be eligible for a bonus offer if it’s your first deposit. You can deposit money into your FantasyDraft account with all major credit/debit cards. In addition, deposits can be made with a PayPal account. All deposits into your account can be made anytime 24/7. To deposit funds into your account, simply select “Add Funds” highlighted in green at the top right of the page. All money you add to your account is converted to FantasyCash, the site currency. FantasyCash cannot be withdrawn and can only be used for site contests. To withdraw funds, you must make a withdrawal request from the Account page. FantasyDraft has a whole section on their site dedicated to responsible gaming. In this section, you’ll see resources provided that are meant to educate and assist players in preventing any gaming problems and seeking assistance if they can’t prevent it. A message states clearly that underage gaming is illegal and explains the ramifications of knowingly allowing a minor to participate in the games on FantsyDraft. The importance of protecting minors from gambling online is underscored here. The content is directed at people who may know someone with a gaming problem or are maybe at risk of developing one themselves. These include messages about setting limits and a detailed questionnaire on problem gaming. We highly recommend this fantasy sports site. FantasyDraft is a fantasy sports platform that lets you draft multiple (despite being capped) lineups with players from all the upcoming competitions in every major US sport being covered. It may be one of the best sites to make rosters for fun or compete with others for big prizes. This is not one of the biggest names in daily fantasy sports but it’s a more than attractive competitor. Although the deposit bonus isn’t very competitive. FantasyDraft has a quality website and great mobile app that features all the capability available on the main site, plus the convenience and accessibility you could only get from a mobile app.